A Clinic at Walmart? | Scott & Co. 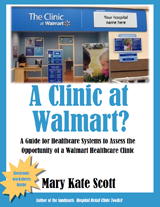 This guide and toolkit includes a comprehensive review of the Walmart retail healthcare clinic option for hospitals, healthcare systems and other healthcare providers. This independent report includes the facts and financials, and a guide to the lease process that will inform the decision making of a management team. This guide will be updated quarterly. Free updates are included duringthe first 12 months. $495 includes the report, tools, updates, and a webinar presentation.